3-Elsie Teresa Crothers was born on 28 Jan 1881 in Brighton, Tasmania, died on 10 May 1969 in Brunswick, East Victoria at age 88, and was buried in Devonport Cemetery, Anglican section. Elsie married Alfred King, son of John Ernest King and Jessie Graham, on 2 Apr 1902 in the Presbyterian Church, Deloraine, Tasmania. Alfred was born on 12 Mar 1878 in Deloraine, Tasmania, died on 3 Sep 1949 at home Madden Street, Devonport, Tasmania at age 71, and was buried on 5 Sep 1949 in Devonport Cemetery, Anglican section. 5-Ralph King. Ralph married Anne in St Marys, Derwent Park. They had three children: Gregory Ralph, Rodney Leonard and Suzanne. 6-Rodney Leonard King. Rodney married someone. She had one son: Daniel Rodney. 4-Elvina Jessie King was born on 9 Mar 1907 in Derby, Tasmania and died on 17 Mar 1970 in St Kilda, Melbourne at age 63. Another name for Elvina was Elvie. Elvina married Hedley Francis Redmond, son of James Francis Redmond and Lucy Evelyn Triffitt, about 1928 in Ulverstone, Tasmania. Hedley was born on 28 Apr 1907 in Zeehan, Tasmania, died on 9 Sep 1983 in Parkville, Victoria at age 76, and was buried on 12 Sep 1983 in Fawkner Crematorium, Melbourne. They had two children: Garry Francis and Janet. 5-Garry Francis Redmond was born about 1932 in Queenstown, Tasmania, died on 18 Jan 1968 in Malvern, Victoria aged about 36, and was buried on 23 Jan 1968 in Springvale Crematorium, Victoria. Garry married Betty Lorraine McCann about 1954 in West Melbourne, Victoria. They had two children: Kirsten Lisa and Katrina Ann. 6-Kirsten Lisa Redmond was born about 1965. 6-Katrina Ann Redmond was born in 1967. 5-Janet Redmond was born about 1939. Elsie Teresa Josephine Crothers was born 28 January 1881 in Brighton, and died 10 May 1969 in Brunswick, Victoria. She married Alfred King 02 April 1902 in the Presbyterian Church, Deloraine. He was born 12 March 1878 in Deloraine, and died 03 September 1949 in Devonport. In 1881, the patrons at the Catholic christening of Elsie at St. Matthews, Pontville, on 6 March, were her mother’s siblings, Nicholas (aged 11) and Ellen Hally (about 22). Alfred was the son of John Ernest King and Jessie Graham, who were married in Launceston, at the ages of 22 and 28 respectively, on 19 March 1866. John Ernest, usually known as Ernest, was born on 20 October 1843, the son of John King and Caroline Bramich. 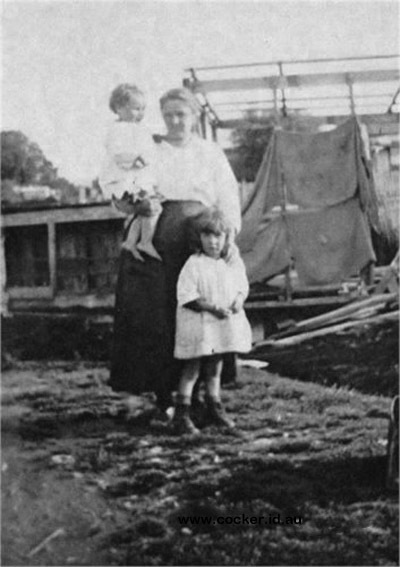 He died at Jackey’s Marsh on 21 January 1907, when his grandson, Leonard King, was aged 3, and a couple of months before his granddaughter, Elvina King, was born. Alfred was the youngest of a family of six. He had 4 brothers – Ernest (1864), Arthur (1866), Francis (1868) and George (1870) - and one sister, Maria (1873). 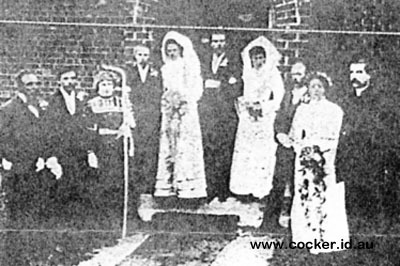 John Crothers is on the far left, so it is likely that Elsie is the bride on the left. The man to her left appears too young to be Alfred, then 24, so may be Elsie’s brother, Walter, aged 15. Alfred could be second from the left, with, perhaps, Julia Crothers on his right. 1906 - Valuation Roll: Ringarooma Road Trust - Alfred was renting a cottage and land of 24 acres from E. Button of Scottsdale, and 50 acres of grass land from the Crown. A couple of months later, Elsie also gave a postcard to her youngest brother, Albert, addressing him by his nickname, Ditty, on his 10th birthday, 16 November 1914. Alfred and Elsie moved to Rosebery sometime between 1915 and 1919. A postcard with the inscription: From Elvie and Len to dear Granny wishing you many happy returns of the day 1.12.17, evidently not posted but handed to Julia Crothers on her 56th birthday, indicates the move came some time after that. 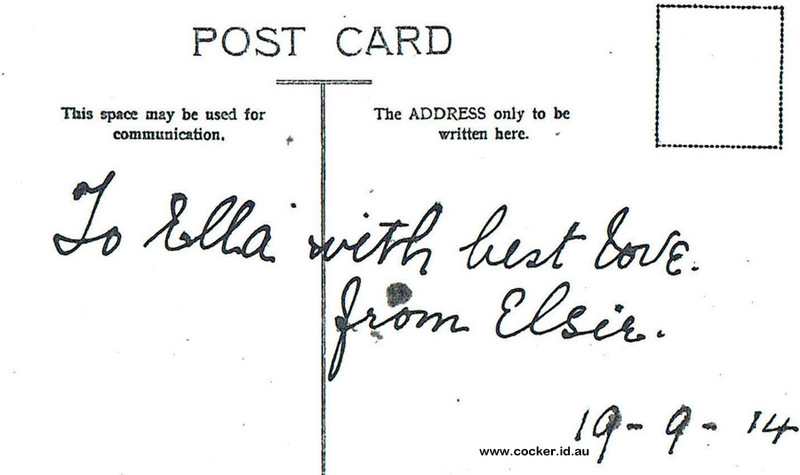 Indeed, another such card from Elsie to her mother a year later indicates it was 1919 before the move was made. However, the postcards may be misleading. One with the inscription: To dear Uncle Willie from Elvie Xmas 1918 could not have been handed to Elsie’s brother, William, at that time, because he did not arrive home from military service in Europe until March 1919. For some reason, Elsie is recorded as being at Rosebery for the 1919 Electoral Roll, but Alfred is not. 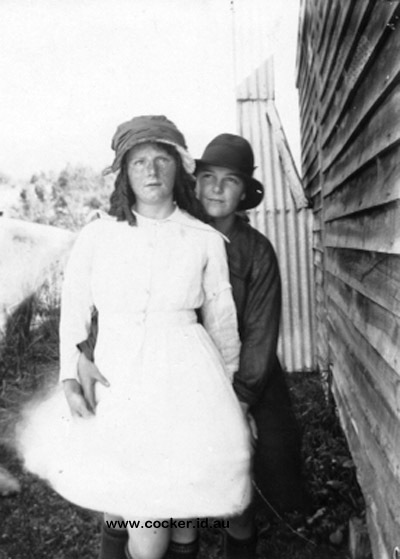 Alfred and Elsie moved to the northwest coast sometime between 1928 and 1937. Neither Alfred nor Elsie was on the Roll. In 1949, a death notice in The Advocate, on 5 September, shows Alfred died at his residence, Madden Street, Devonport, in his 72nd year, and that Len lived in Moonah and Elvie was Mrs Redmond of Brunswick, Victoria. He was buried on 5 September at the Devonport General Cemetery. Alfred’s will, dated 22 June 1945 and given probate on 31 January 1951, left his whole estate to Elsie, except for a “cash legacy” of 100 pounds to his sister-in-law, Eileen Crothers. In 1969, a death notice in The Advocate, 13 May, shows Elsie Teresa dying at her residence, 113 Tinning Street, Brunswick. Elvie was living in Brunswick, so Elsie may have died at her daughter’s home. There was no funeral notice. She was buried in the Devonport General Cemetery next to Alfred. The tombstone in the Anglican section, Row F, No. 36, reads: In Loving Memory of Alfred King Beloved Husband of Elsie Also Elsie Teresa King At Rest. Elsie’s age shown on the tombstone is 84, instead of 88. Children of Elsie and Alfred King are: Leonard Alfred Milton King, Elvina Jessie King. Leonard Alfred Milton King was born 12 September 1903 in Derby. 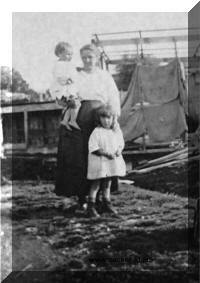 He married Daphne Myrtle Priscilla Bullock, born 16 November 1908 at 3 Brisbane Street, Hobart. Daphne had English ancestors on the side of her father, Albert, who had emigrated from Norfolk, and Irish roots through her mother, Annie Montgomery’s, parents, who had come, in 1884, from Counties Tyrone and Cork. Both Albert Bullock and John Montgomery served in the police force in Hobart. Len worked for the EZ Company at Risdon. In 1983, Daphne died on 24 June, aged 74, in her home at 20 Main Road, Moonah. She was buried in the Kingston Lawn Cemetery. Just over two years later, Len died, aged 81, on 12 July 1985 in Royal Hobart Hospital. He had remained living in the family home. His son, Ralph, was nearby at 5/9 Florence Street, Moonah. Len was buried on 15 July in the same plot as Daphne. 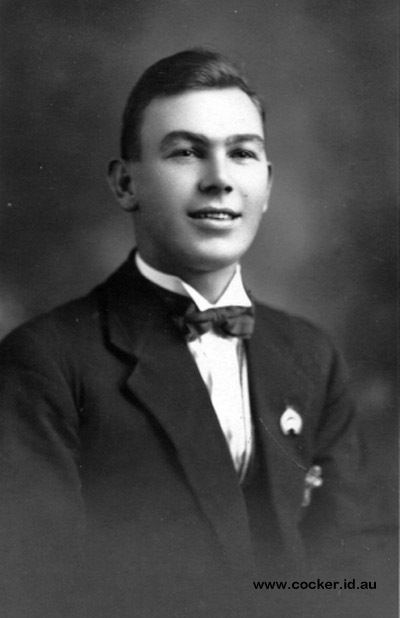 Len King 1925 – on his wedding day? Elvie was born 9 March 1907 in Derby. She would have attended school at Branxholm and, her parents having moved to the West when she was about 10, at Rosebery. The Advocate of Saturday 14 May 1927 mentioned her: Miss Elvie King, Rosebery, paid a short visit to Zeehan during the week. Perhaps she was visiting the Redmond family. She married Hedley Francis Redmond in Ulverstone in about 1928. 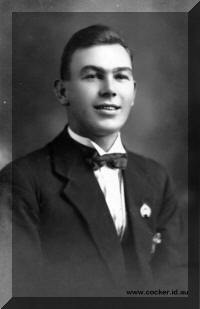 He was born in Zeehan on 28 April 1907, son of James and Lucy nee Triffitt Redmond. Hedley was an engineer, probably specialising in mining. Hedley and Elvie left for Melbourne in the 1930s – either about 1934, when Garry, who had been born in Queenstown, was 2, according to his death certificate; or 1939 according to Elvie’s. A family story, has it that their daughter, Janet, may have been born deaf and dumb, because Elvie had caught measles when pregnant. Hedley enlisted in the Australian Army at Caulfield on 19 February 1942, when living in Daylesford. He was discharged on 19 September 1943, after serving in the 2/6 FID Coy. The Norther Miner of Charters Towers, Queensland, in its edition of 6 July 1950, names a Hedley Redmond, a mining engineer, as the managing director of Kirk Limited and Arizona Limited, two NSW mining companies which were working a gold reef at Kirk Diggings. Unless there was the most unlikely co-incidence of another engineer bearing the same name, it seems that Hedley, and possibly, Elvie, were living at the time outside Victoria. Elvie’s grandchildren, Kirsten and Katrina, were born in 1965 and 1967. But she, her mother, Elsie, and her son, Garry, were not to enjoy their company for long. First, Garry died early in 1968, followed by Elsie in March 1969 and Elvie in 1970. Elvie was living in Brunswick when her mother died and at 7 Murchison Street, St. Kilda, with Hedley, when she, herself, died of a coronary occlusion on 17 March 1970, at the age of 63. Two days later, she was cremated at the Fawkner Crematorium. Widower Hedley married again the following year, at the age of 64. His second wife was Vivienne Cattran. The wedding was in Sydney. Hedley died at Parkville, Melbourne, on 9 September 1983. He had been suffering from motor neurone disease for three to four years. At the time, he and Vivienne were living at 3 Penleigh Court, Moonee Ponds. He was cremated at Fawkner Crematorium on 12 September 1983. Vivienne died in 1986. The Victorian BDM website shows she was the daughter of Walter Henry Stewart and Annie Cahill. Ralph King married Anne in St. Marys Anglican Church, Derwent Park. Jean Smith, daughter of Elsie’s sister, Elizabeth (Corrie), remembered attending the wedding with her husband, Leo. Ralph was proprietor of King’s Caravan business in Main Road, Moonah. 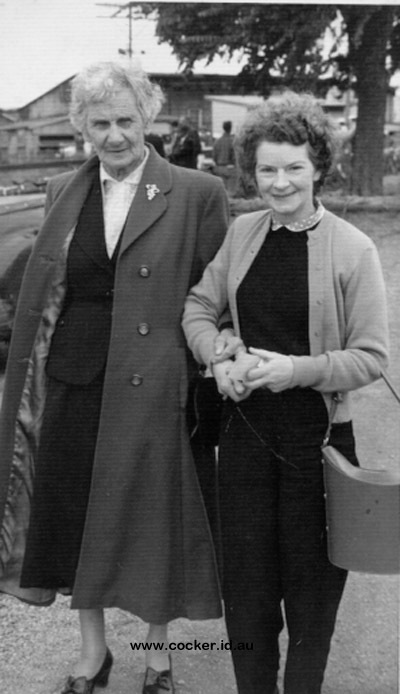 Elsie and Anne – 1950s? His mother's death notice, in The Mercury of 25 June 1983, showed her as Nan of Leanne as well as of Greg, Rod and Sue; also as "special friend of Fiona, Dean and Molly," who were, presumably, the spouses of her children. The identity of Leanne is yet to be discovered. Garry was born in Queenstown in about 1932. He married Betty Lorraine McCann in West Melbourne in about 1954. He worked as a loss assessor. On 18 January 1968, at the age of 35, he died from a brain tumour. His home with Betty and their two daughters, Kirsten and Katrina, aged 2 years 5 months and 6 months respectively, was at 26 Ellerslie Place, Toorak. He was cremated at Springvale Crematorium on 23 January. Children of Garry and Betty Redmond are: Kirsten Lisa Redmond, Katrina Anne Redmond. Janet was born in Victoria in 1939 or 1940, some time after her parents had crossed from Tasmania. She was alive, aged 43, when her father died in 1983.